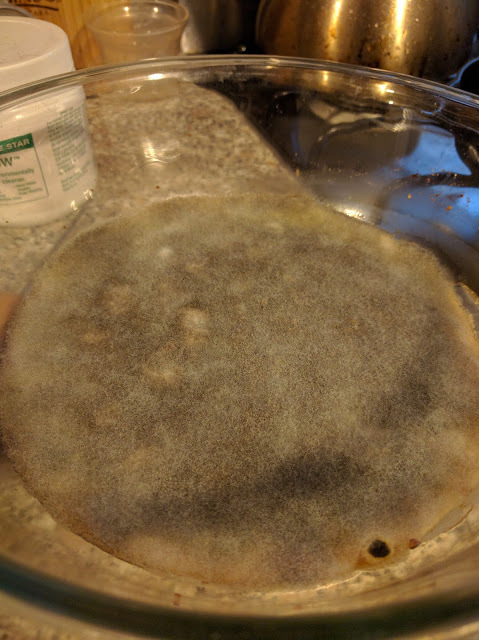 I posted about rice cooking methods a little while ago, with mixed success, but I think I've got it down now. The secret? 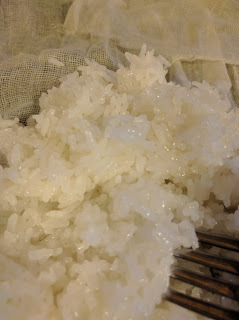 I had initially thought that I could measure hydration of the rice by how much it expanded, and since it's done expanding after about an hour or so I stopped soaking there. But what a difference soaking overnight makes! Soaking didn't seem to affect the millet much, which might be why Qimin Yaoshu says to steam it twice. It's also probably why I didn't have as much trouble with millet wines. I tried steaming a second time since I was steaming the millet anyway, and poured a little bit of cool water over the rice and millet before returning it to the steamer. The rice was 100% cooked throughout, as was the millet, although the millet feels a bit dry to the touch. I'm trying to get a short wine recipe to work, but it's tricky. 浸麴發如魚眼湯。 Soak the yeast cakes until they bubble with bubbles the size of fish eyes. Sadness. It's covered in a slick of fungus.